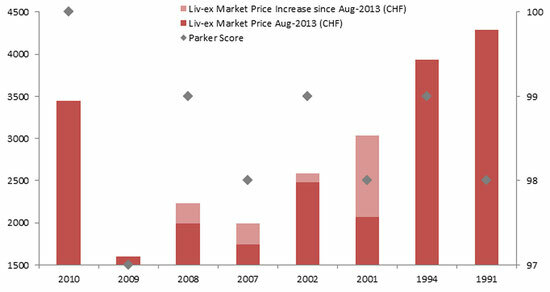 The remaining positive sub-index of the Liv-ex Fine Wine 1000 in 2014 is the Rest of the World 50, currently +2% YTD. There are only five wines within this sub-index, and ten recent physical vintages are tracked: for Napa Valley’s Dominus, these are currently 2000-2009. The top end of Dominus (97 Parker points and beyond) are charted above, along with their price movements over the last twelve months. It is clear that 2001 has been a significant positive influence on the aforementioned indices, and vintages 2007 and 2008 have the potential to continue the positive trajectory. 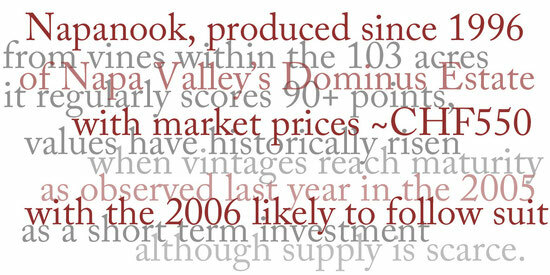 Vintage 2009 received 97 points from Robert Parker and is very well regarded by other critics including James Suckling and Antonio Galloni; potentially one of the better value vintages. The blockbuster 2010, which is 95% Cabernet Sauvignon, will be interesting to follow: will the market sustain this price premium in the short term? As an aside, winemaker Todd Mostero pointed out that “2011 should be an interesting vintage to watch age”, it being the coolest growing season for 30 years. For those watching California’s positioning as the turbo-charged ‘fruit bombs’ vis-à-vis the traditional Bordeaux style, the 2011s might also offer guidance as to a potential shift in style.